Our Five Ring Circus: Gutzy Gear Party! 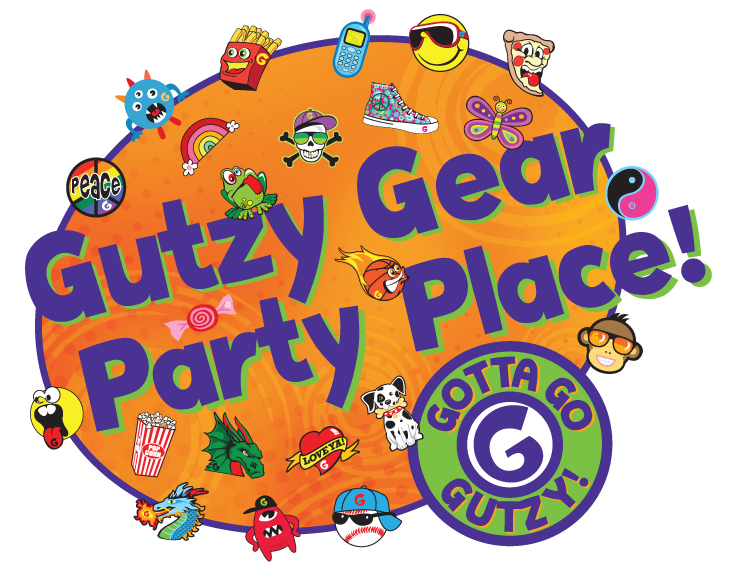 I was recently contacted by Gutzy Gear to host a party for them! Gutzy Gear is a way for kids to customize their backpack or bag with Gutzy strap covers and Gutzies, which are removable patches. Kids can collect Gutzies or even trade them! 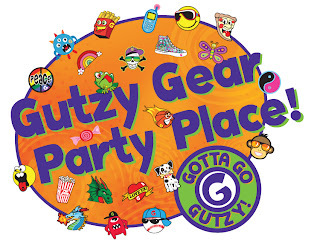 Gutzy Gear can be found at Toys R Us, Kmart, Walmart, and Target, to name a few. You can use their store locator to find a store near you! Check out Gutzy Gear's website for more information! They can also be found on facebook and twitter. I was very excited to host a party sponsored by Gutzy Gear! Dylan is starting 2nd grade this Fall, and Lexie is going to Kindergarten. They have a lot of friends and cousins in the same age group, so this was a great opportunity! School is starting in a month, so back to school shopping is in full swing. I knew the kids would enjoy this product! We were sent starter kits for each guest that included 1 set of Gutzy strap covers and 1 Gutzie. In addition, each guest got to take home 2 additional Gutzies! As soon as the box arrived, my kids asked for their starter kits. They eagerly put them on their new backpacks! I was impressed with how easily the Gutzy strap covers attached to the backpack straps. The Gutzies are easy to put on and move around. The best part? No sewing required, because they are Velcro!!! My kids loved looking at the selection of Gutzies. They already have their favorites picked out! Before the party, I set up a table that held the Gutzy strap covers, some information for the moms, a paper that showed the series 1 Gutzies, and a backpack modeling the Gutzy strap covers. Upon arrival, the kids flocked to the table to check out the Gutzies. They had a great time pointing out all the Gutzies they liked! I had a few early guests (plus Dylan and Lexie) try on the backpack! Once the majority of the guests arrived, we got started with the activities. Gutzy bingo was a hit! They loved choosing their Gutzies! We had a few (very) late guests, so they played a quick game of pin the Gutzies on the backpack so they could choose their own Gutzies to keep! The kids had a great time, and were happy to show off their new Gutzies! The kids really enjoyed their Gutzy Gear! There were even a few trades as the party neared an end, and some plots to hit up our local Toys R Us for more Gutzies! The most exciting part was taking home their very own Gutzy strap covers and Gutzies! I owe Gutzy Gear a big thank you for giving me the opportunity to host this party! Oh my goodness, too cute!! They sure had a great time! well where have i been?! never heard of them. but they look super cool. my kiddos would love it! Is the velcro strong enough to keep the patches on?